The features of Google Earth, introduced in the summer of 2005, give us the possibility to travel "virtually" to the historical locations of the Tarvin family from the convenience of a high-performance Windows or Macintosh computer. 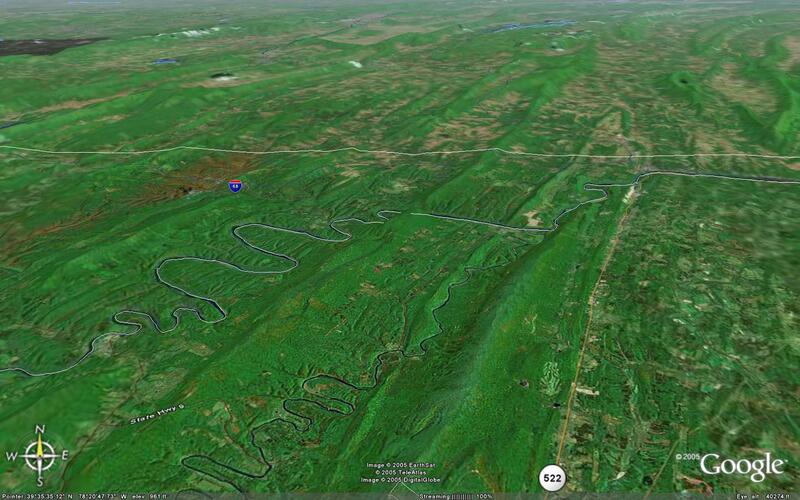 For example, here is an image of a Google Earth visit to the Cacapon River valley in West Virginia, where Rev. George Tarvin farmed and raised his family before migrating to Kentucky. The straight white line across the middle of the picture is the Mason-Dixon line which is the boundary between Pennsylvania to the north and Maryland to the south. The white line that follows the curvy Potomac River is the Maryland-Virginia border in colonial times. Now it divides Maryland from West Virginia. The squiggly river flowing northward toward the Potomac is the Cacapon River. Rev. George owned land upon the Cacapon about a mile from the Potomac. The great sweeping curves of the river indicate the land slopes very gently between the mountain ridges, indicating a predeliction to seasonal flooding. If you have Google Earth installed on your Mac or PC, you can download a "placemark" to take you there inside the Google Earth program, then zoom around the region. We have some placemarks here for this location plus others of interest to Tarvin Family members.